Encourage the proper disposal of litter and enhance the appearance of your public with these recycled plastic waste receptacles. 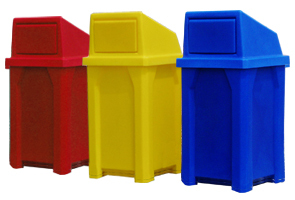 Made from recycled plastic polyethylene, these waste receptacles are manufactured to withstand the harshest environments. These recycled plastic waste receptacles will not fade, rust or crack making them ideal	for use outside as well as inside.